From the moment of curtain went up, this thrilling panto enthralled the crowd. It's a rip-roaring ride of jokes, songs, dances and a wonderful evil stepmother in the shape of Sue Holderness (Marlene from Only Fools and Horses). This panto at Malvern stars dwarf actors, unlike its Birmingham Hippodrome neighbour performing the same story, who add an extra special zest to the show.Although the names of the dwarfs have been changed to modern alternatives, so we have Kip instead of Sleepy and the like. The panto more or less follows tradition in set and storyline with a few pop songs and musical numbers to help it along the way. The script also cleverly weaves in current jokes that go over the younger members of the audience's heads but add some fun for the adults on the likes of Rebekah Brooks and Miley Cyrus' twerking. Our heroine is played by Olivia Birchenough from Channel 5 children's show Milkshake, whose ever-smiling, kindly Snow White wins over the dwarfs and the audience. 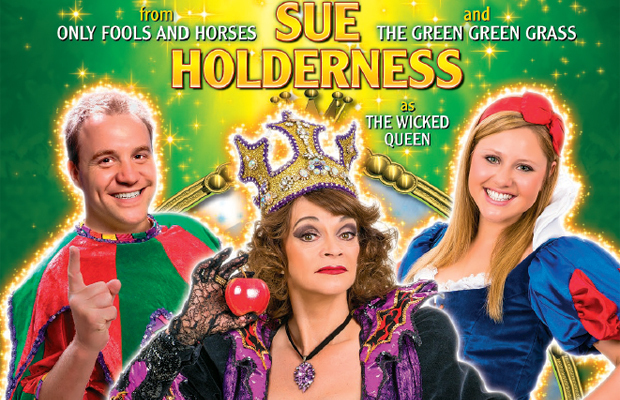 At the other end of the spectrum, Sue Holderness is deliciously evil as the Wicked Queen and relishes the boos. She also shines as a comedy actress, adding plenty of quips and even dropping in a few lines about Del Boy. It's a good strong cast all round but when it comes to winning over hearts, it's not Snow White but her best friend Muddles (Chris Pizzey from The Basil Brush Show) who gains adoration. 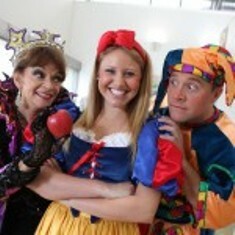 Pizzey is wonderful with the children in the audience, along with the adults, and attracts the biggest cheers. All in all, this is a fantastically fun show that will make you shout, boo, hiss and most of all, smile. A great way to entertain the children over Christmas and New Year. Tickets cost £10.02 - £25.20 from Malvern Theatres website.